GGP Newsletter no. 44 is now available! Read our latest newsletter to learn about how GGP is collaborating with CLARIN and EVS on the Social Science and Humanities Open Cloud (SSHOC) project. Other items include links to the GGP’s new technical guidelines and other resources for national teams interested in fielding GGP in their countries. News about recent & upcoming events and publications is also provided. As the end of 2018 nears, we are pleased to launch the Generation & Gender Programme’s re-styled Newsletter! This shift to a new platform and layout makes it possible to make publish new, dynamic data visuals while continuing to provide our User Community with updates from the GGP as well as news items about upcoming events and recent studies conducted using GGP datasets. We hope you enjoy the new look. The December 2018 edition has details of the October 2019 User Conference in Paris, a interactive life history data viz, the latest Population Europe Discussion Paper on Gender (In)Equality over the Life Course and news from the GGP. Click on the orange button above to get your copy! In the 1950s and 1960s, families generally followed the male-breadwinner model characterized by a clear gender division of labour both in terms of paid and unpaid work. The graph below shows the percentage of women who report dividing household work equally with a partner. Equal division of labour depends heavily on the household task considered. Equal responsibility for planning social events is common with 40-80% of women reporting to share this task with her partner. Additionally, financial chores are among the tasks often divided between partners. However, other chores – such as cooking and vacuum cleaning, and performing small repairs – mostly fall on the shoulders of one of the partners: cooking and vacuum cleaning are mostly done by women, while performing small repairs is mostly done by men. Data from the GGP can help inform policies in ways to further support gender equality. Source: GGP2020 for Belarus and Kazakhstan and GGP wave 1 for the other countries. 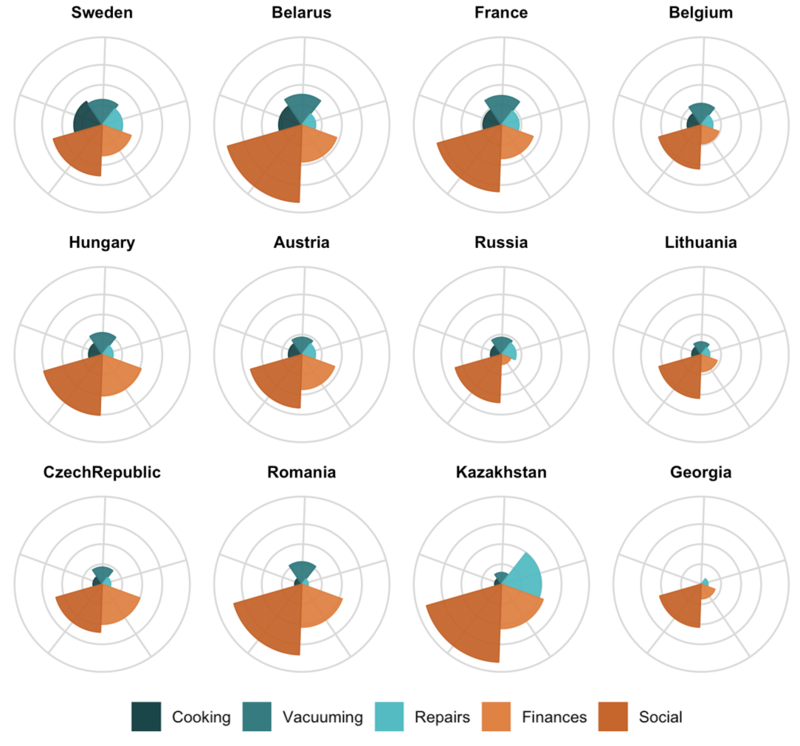 Countries are ranked by the proportion of women reporting dividing cooking equally with their partner. Families in Europe and elsewhere are becoming more complex, with an increasing number of couples living in unmarried cohabitation or experiencing a separation or divorce. The GGP provides data not only on actual family transitions, but also on norms and values regarding family-related behaviour. 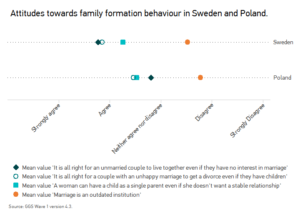 Figure 1 shows the attitudes towards marriage, cohabitation, single parenthood, and divorce for two countries: Sweden (data collected in 2012/13) and Poland (data collected in 2010/11). Swedes are generally more open to new family forms than Poles. Yet, country differences in attitudes about cohabitation are notably larger than, for example, single motherhood. Also, within countries large differences are found. While on average Swedes believe it is okay for a couple to live together without being married, they do not agree that marriage is an outdated institution. The Swedish case thus shows that the increasing acceptance of new family forms does not necessarily mean a rejection of more traditional family arrangements.